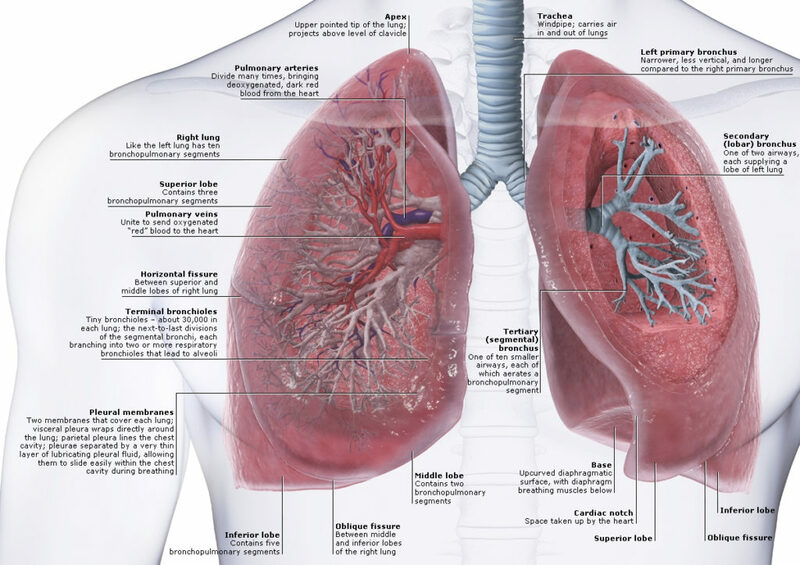 The human lungs are a pair of lungs, spongy organs optimized for gas exchange between our blood and the air. Our bodies require oxygen to survive. The lungs provide the body with essential oxygen while removing carbon dioxide before it can reach hazardous levels. In the inner surface of the lungs could be stretched out flat, they would occupy an area nearly 80 -100 square meter, nearly the size of half of the tennis a tennis court. The lungs provide the body with the air it needs to make sounds such as to speak, sing and laugh. The pleura are serous membranes, with two layers, surrounding each lung. Pleura are attached to the thoracic cavity, while parietal pleura develop the outer layer of the membrane. The visceral pleura makes the inner layer of the membrane coating the outside surface area of the lungs. Between the Visceral and parietal pleura, there is the pleural cavity, which forms a hollow space in the lungs to expanding during inhalation. The serous fluid secreted by the pleural membranes lubricates and reduces friction inside the pleural cavity to prevent stress to the lungs during breathing. The lungs occupy the majority of the space inside the thoracic cavity. The lungs extend laterally to form the heart to ribs on both the chest and continue posteriorly toward the spine. Each soft spongy lung is a cone-like shape with the superior end forming the point of the cone and the inferior end making the base of the cone. The superior end of the lungs becomes narrow to the rounded top called the apex. The inferior end of the lungs is referred to as the base and sits on the dome-shaped diaphragm. The bottom of the lungs curves to follow the shape of the diaphragm. The left lung is slightly smaller than the right lung due to 2/3 of the heart being position on the left side of the body. They left lung contains the cardiac notch, an indication in the lung that surrounds the apex of the heart. 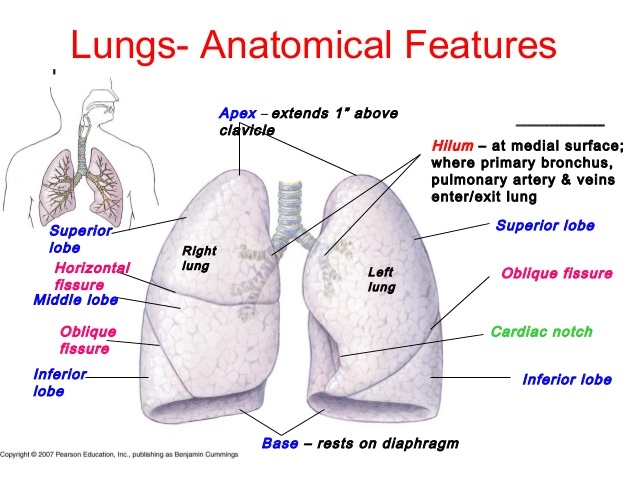 Each lung consists of several distinguished lobes. The right lung ( the large of the two ) has three lobes – the superior, middle, and inferior lobes. The horizontal fissure divides the superior lobe from the middle lobe, while the right oblique fissure holds the middle and inferior lobes. 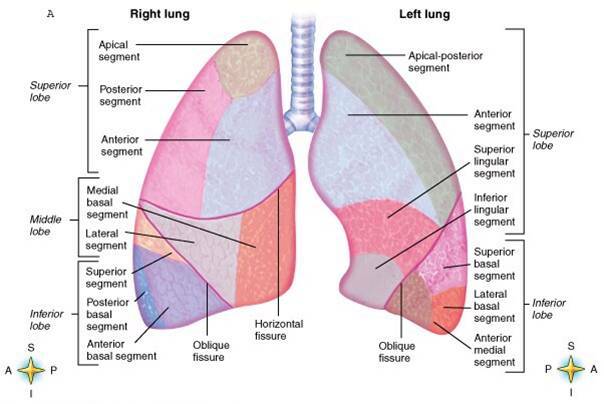 The smaller left lung only has two lobes, the superior and inferior, separated by the left oblique fissure. Air enters the body through the nose and mouth and passes through the pharynx, larynx, and trachea. Right before reaching the lungs, the trachea will split the left and right bronchi, which are large hollow tubes consisting of hyaline cartilage and is filed with pseudostratified ciliated epithelium. The hyaline cartilage of the bronchi creates incomplete ring-shaped similar to the letter “C” with the opening of the ring facing toward the posterior end of the bronchi. The rigid hyaline cartilage stops the bronchi from falling and obstructing airflow to the lungs. Pseudostratified epithelium lines the interior of the hyaline ring and connects the inoculated ends of the ring to form a deep tube-shaped lie the letter “D” with the false portion of the viewing the posterior direction. Each lung draws air from a single, large primary bronchus. As the primary bronchi enter the lungs, they branch into smaller secondary bronchi that carry air to each lobe of the lung. Therefore the right bronchus branches off into 3 secondary bronchi while the left lung branches off into 2 secondary bronchi. The secondary bronchi additionally branch into many shorter tertiary bronchi within each lobe. The secondary and tertiary bronchi improved the efficiency of the lungs by distributing air every within each lobe of the lungs. The pseudostratified epithelium that borders the bronchi contains many cilia and goblet cells. Cilia is small hair-like cellular projects that extend from the surface of the cells. Global cells are specialized epithelial cells that secrete mucus to coat the lining of the bronchi. Cilia move collectively to push mucus discharged by the goblet cells apart from the lungs. Particles of dust and even pathogens similar to viruses, bacteria, and fungi in the air penetrating the lungs stick to the mucus and are taken out of the respiratory tract. In this way, mucus helps to lungs clean and free of disease. Many small bronchioles section off from the tertiary bronchi. Bronchioles deviate from bronchi in size, (they are smaller) and the composition of their walls. Although bronchi have hyaline cartilage rings in their walls, bronchioles are composed of elastic fibers and smooth muscle tissue. The mass of the bronchiole walls allows the diameter of bronchioles to change to a significant degree. When the body requires a greater volume of the air going into the lungs, such as through exercise, the bronchioles dilate to permit greater air flow. In responses to dust or other surrounding pollutants, the bronchioles can squeeze to limit the pollution of the lungs. The bronchioles additionally section off into many tiny terminal bronchioles. Terminal bronchioles are the tiniest air tubes in the lungs and stop at the alveoli of the lungs. Similar to bronchioles, the terminal bronchioles are elastic, able of dilating or contracting to control airflow into the alveoli. Alveoli are working units of the lungs that permit gas transfer between the air in the lungs and the blood inside the capillaries of the lungs. Alveoli are located in small clusters referred to alveolar sacs at the end of the terminal bronchiole. Each alveolus is a deep, cup-shaped hole enclosed by many tiny capillaries. The walls of the alveolus are lined with simple squamous epithelial cells known as alveolar cells. A thin layer of connective tissues underlines and supports the alveolar cells. Capillaries surround the attached tissue on the outer border of the alveolus. The respiratory membrane is created where the walls of a capillary touch the walls of an alveolus. In the respiratory membrane, Gas exchange occurs freely between the air and blood through the fragile walls of the alveolus and capillary. Septal cells and macrophages are also located inside the alveoli. Septal cells generate alveolar fluid that covers the inner surface of the alveoli. Alveolar fluid is very critical o lung function, as is a surfactant that saturates the alveoli, helps support the flexibility of the lungs, and limits the thin alveolar walls from collapsing. Macrophages in the alveoli keep the lungs clean and free of infection by taking and phagocytizing pathogens and other extraneous matter that infiltrate the alveoli along with inhaled air. Our lungs get air from the external environment through the process of negative pressure breathing. Negative pressure breathing requires a pressure differential between the air inside the alveoli and atomistic air. Muscles encompassing the lungs, such as the diaphragm, intercostal muscles, and abnormal muscles, extend and contract to alter the volume of the thoracic cavity. Muscles expand the thoracic cavity and lessen the pressure inside the alveoli to bring atmospheric air into the lungs. This process of bringing air into the lungs is identified as inhalation or inspiration. Muscles can also contract the size of the thoracic cavity to expand the pressure within of the alveoli and push air out of the lungs. This process of forcing air out of the lungs is known as an exhalation of expiration. Natural breathing consists of several different mechanisms. Shallow breathing is achieved by the contraction of the diaphragm and him external intercostal muscles for inhalation. During exhalation, the muscles releasing as the elasticity of the lungs returning to their resting volume expel air out fo the lungs. Our bodies perform deep breathing by a pronounced inferior or lower movement of the diaphragm towards the abdomen. The external intercostal muscles along with sternocleidomastoid and scalene muscles in the neck fills the space between the ribs, which increase the volume of the chest. During deep exhalation, the internal intercostal muscles, and abdominal muscles contract to lower the volume of the thoracic cavity driving air out of the lungs. Eupnea is the soft breathing the happens when the body is at rest. During eupnea, the body mostly depend on son shallow breathing with deep breaths seldom occurring as the body needs somewhat higher levels of gas exchange. The complete air volume of the lungs is about 4 to 6 liters and changes based on the person’s respiratory health, size, and gender. Lung volumes are measured clinically by an apparatus known as the spirometer. Normal shallow, breathing just passes a small fraction of the lungs’ total volume into the and out of the body with each breath. This amount of air, known as tidal volume, usually contains only around 0.5 liters. Deep breathing can for air into and out of the lungs during shallow breathing. The volume of air exchanged using deep breathing is referred to as vital capacity and ranges between 3 to 5 liters, based on the lung capacity of the individual. There is a remaining volume of around 1 liter of air that remains in the lungs at all times, even during a deep exhaustion. Fresh air entering the lungs with each breath mixes with the residual air in the lungs so that the residual air is gradually exchanged over time even at rest. External respiration is the method of exchanging oxygen and carbon dioxide between the air inside the alveoli and blood in the capillaries of the lungs. The air inside the alveoli includes a higher partial pressure of oxygen opposed to the blood in the capillaries. 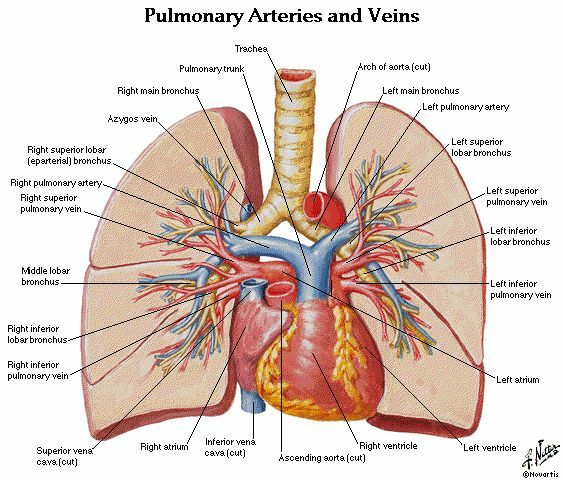 Conversely, blood in the lungs’ capillaries comprises a higher partial pressure of carbon dioxide compared to the air in the alveoli. These partial pressure trigger oxygen to diffuse out into the air as well into the blood via the respiratory membrane. Also, carbon dioxide diffuse out the blood and into the air through the reports membrane. The exchange of oxygen into the blood and carbon dioxide into the air allows the blood be leaving the lungs to provide oxygen to the body’s cells, during deposition carbon dioxide water into the air. Breathing is controlled by brand may be controlled both consciously and unconsciously. Unconscious control of breathing is maintained by the respiratory center of the brainstem. The respiratory center monitors the concentration of gasses in the blood and adjusts the rate and depth of breathing as required. During exercise or other exertion, the disparity center automatically increases the breathing rate to provide constant levels of oxygen to the blood. While at rest, the respiratory center decreases the breathing rate to stop hyperventilation and keep normal oxygen and carbon dioxide levels in the blood. Consious control of breathing is mounted by the cerebral cortex of the brain. The verbal cortex may override the respiratory center and often does so during activities such as speaking laughing and singing. Unconscious control of breathing resume as soon as conscious control of breathing ends, preventing the body from suffocating from lack of breathing.